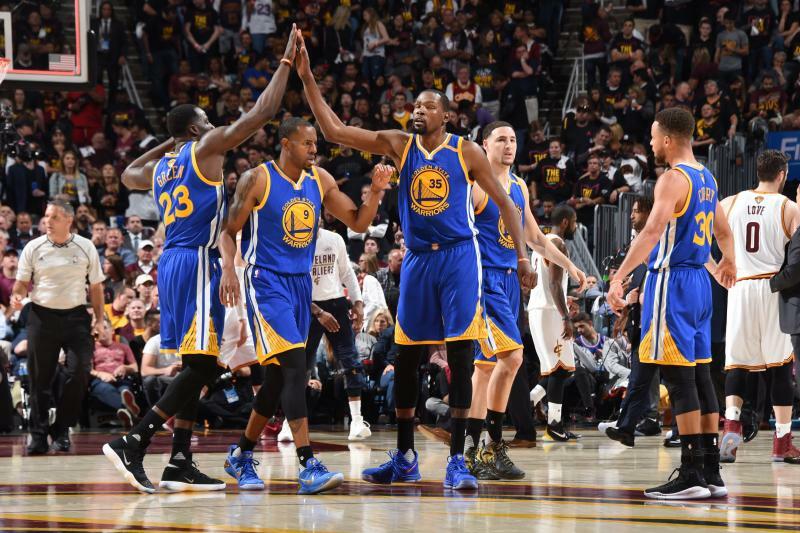 The Golden State Warriors are within 1 game of winning the NBA Finals. CLEVELAND, OH—The Golden State Warriors scored the final 11 points in the closing minutes of sensational Game 3 of the NBA Finals, 118-113 at Quicken Loans Arena in Cleveland to take a commanding 3-0 series lead over the Cleveland Cavaliers on Wednesday, June 7. The Warriors mounted a furious rally in, ‘The Land’ and stole one as Kevin Durant hit a go ahead three pointer with 45 seconds in the exhilarating game every NBA fan has been eagerly waiting for. Primetime TV is about the stars-and every star from the Cavs’ and Warriors respectively showed up in this nail biter. Kevin Durant scored 31 points, 14 in the fourth, and grabbed 8 rebounds, his three was over the outstretched arms of LeBron James putting Golden State a mere victory from redemption: The NBA Title. Kyrie Irving had his breakout performance shaking and baking for 39 points, while LeBron James added 38 points, the duo’s 77 combined points was outstanding in defeat. Steph Curry had 26 points to go along with 13 rebounds, while fellow Splash Brother Klay Thompson hit everything in sight for 30 points. The Golden State Warriors continue their unstoppable winning streak, DUB Nation is an astonishing 15-0 this postseason, a mere win from an historic 16-0 NBA record, and have the opportunity to cap off a flawless Playoffs. Even sweeter if the Warriors swept their arch rivals the Cavs by celebrating on the floor of the franchise that ripped their heart out last year. This was a devastating loss for the Cavaliers, everything went right and still those final minutes will haunt them. They went ice cold at the worst possible time going 0 for 8 down the stretch. Trailing by three, 116-113 with 12 seconds remaining, the Cavaliers had a ripe chance to send this thriller into overtime with a three. On an errant inbound pass, Andre Iguodala blanketed James, deflecting the ball went off LeBron’s arms, the fate was sealed. The main storyline of the 2017 NBA Finals has been the battle for league supremacy- King James or KD? Durant followed the template LeBron set up in 2010 when James joined the Miami Heat, by joining a so-called “Superteam.” As Durant casually dribbled the ball past the half court line, no one imagined he dare attempt a 3-pointer. The shot will be seen on NBA highlight reels forever, standing as the defining moment Kevin Durant he became the NBA’s best player. Get out the brooms on Friday night, the Warriors are poised for a sweep and a spot as potentially the greatest team in NBA history. After J.R. Smith swished a three to extend the lead to 113-107, it appeared to be the final dagger, unfortunately, for the city of Cleveland, LeBron and the Cavaliers CHOKED and gave this one away. At halftime, the Warriors were up by six, humming to the tune of 66 points. The Cavs supporting cast played well, especially Kyle Korver and J.R. Smith who were clutch. In the aftermath of an historic comeback, the Warriors avenged consecutive Game 3 finals losses. The Cavaliers have dug themselves an even greater hole than last year, when all looked hopeless facing a 3-1 series defect. This year, the Cavaliers will have to one up their recent achievement, winning four in a row. A feat which has never occurred. Time Tune in Friday, June 9 as Game 4 begins at 6:00 p.m. PST and will air on ABC.